FROM WIMBLEDON — Wimbledon has finally started, and on day one there were some fantastic wins, and some sad defeats. Let’s start with the No. 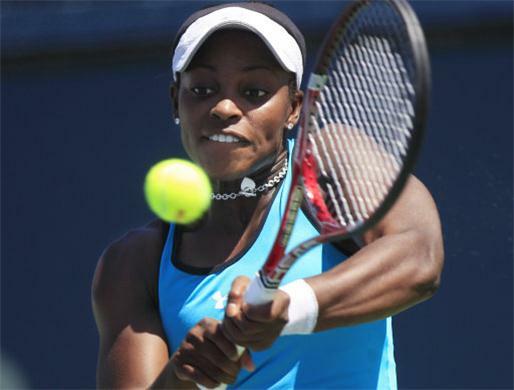 4 Sloane Stephens went down to Donna Vecic 6-1, 6-3. The Croat jumped on the ball quickly, and she moved around nimbly and precisely, while the American could not find her feet. She made too many errors, she lost the rhythm. She did try at the end, but she could not work enough points to make a competitive match. It was pretty surprising. Stephens won the 2017 US Open, and she reached the 2018 Roland Garros final, so the No. 4 has played some fine contests. But not this time. She was a little upset. Maybe a lot. Her performance here was reminiscent of her tumble after her US Open victory when she failed to win a match in the fall tournaments. So she will work even harder, back to the United States. Whatever she says, there will be pressure, a lot of pressure. She is the defending champion of the US Open. Now, when she rose up during the last year, a huge amount of fans took notice. During the rest of this summer, they will pay attention. And perhaps, so will Sloane. It was going to be, sooner or later. That is Stan Wawrinka, the three-time Slam champion, who chopped down Grigor Dimitrov 1-6, 7-6, 7-6, 6-4. After the first set, it looked like the Swiss was going nowhere. But in the second set, he clammed down, his head was in the right place, he mixed it up, and when he had an opportunity, he hit it in the corners. Finally, the recently injured player was back. At least on Monday. That he did. Dimitrov has had a terrific 2017, winning the ATP Finals, and he rose up to No. 3. But this year, the Bulgarian has struggled, especially at the Slams. Unfortunately, he was unable to go to go very deep, which can be brutal. At the Aussie Open, he actually reached the quarters, but he lost in four sets against the improved Kyle Edmund. At Roland Garros, he won an amazing match against the young American Jared Donaldson, 10-8 in the fifth, but two days later, he was tired and he lost pretty easily to Fernando Verdasco. Now, at Wimbledon in the first round, he was confused. But he won’t give in. “You kind of have to stay positive, simple as that. You can’t just go down on yourself. Yeah, it’s been a rough road so far,” Dimitrov said. On Monday, both Wawrinka and Vecic scored a huge victories. Mr. Stan and Donna have been dating for a while. They watch each other playing whenever they can. They did it in the bright sun.